Cut the chunk of bacon into 1/4″ by 1 1/2″ slices. Thinly slice the onion. Heat the olive oil quite hot without smoking. Lightly brown the bacon and sliced onion. Remove. Dry each piece of stew beef. Brown the beef well on all sides. Add to bacon and onion. Sprinkle flour, salt and pepper over the mixture coating all sides. Place in 400F oven for 2 minutes. Remove, flip each piece and replace for an additional 2 minutes. This creates a coating. In a large bowl pour 3 cups of red wine, 3 cups of beef stock and one tablespoon of tomato paste. Stir until combined. Add carrot, celery, garlic, thyme and crumbled bay leaf. Add beef, bacon, onion mixture once cooled. Refrigerate. Melt butter. Add pearl onions. Brown… knowing you can’t do this uniformly… just get some good color on them. Take care to leave them whole. Remove from heat and allow to cool. Add enough wine to just cover them. Wrap herbs in cheesecloth and add. Refrigerate. Add beef mixture to crockpot and cook on low a minimum of 4 hours. Place onion mixture in saucepan. Simmer, uncovered until most of the wine has evaporated. Cook your choice of boiled potatoes, rice or my favorite, wide egg noodles. Remove carrots and celery from the beef mixture. Plate the pasta, rice or potatoes first, then the beef mixture in the middle surrounded by the onions. Look at that! 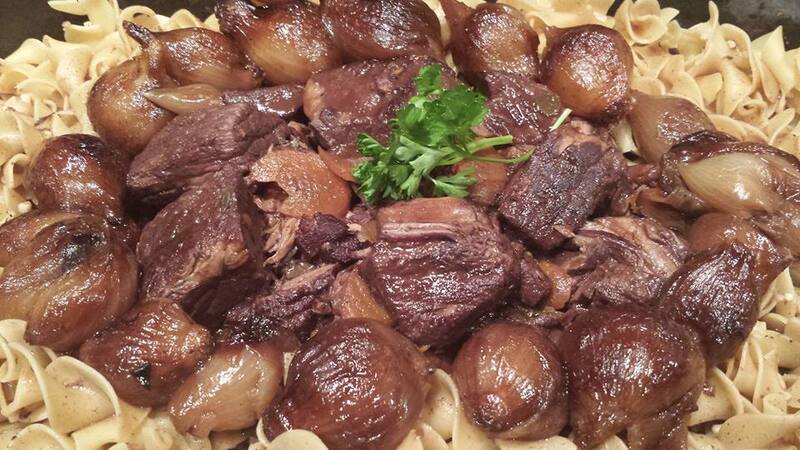 You made a classic Bœf Bourguignon! Go brag a little! Reblogged this on Chicago Chef Lee.